Went to my first Smoker at the ADC, by Cambridge Footlights. There were a couple of really good sketches: a priest preaching about genesis (very funny monologue), and a great sketch based on Hansel and Gretel. The quality was patchy, but overall it was really good fun. Only one person was heckled for poor material and he recovered very well. Consistently ‘fast and hilariously unrelenting’ (TCS), the world-famous Cambridge Footlights present a jam-packed hour of stand-up, sketches, songs and more. Sometimes quirky, sometimes edgy, some trad, some silly, some sad – the one thing a Smoker never fails to be is ‘uproariously funny’ (Varsity). Over the past fifty years, Footlights has been producing some of the UK’s most exciting and innovative comic writer-performers. The Smokers are where it’s all learned and all honed, all tried and all tested. Come watch the finest in Cambridge comedy talent perform brand new material in a massive range of styles, from the absurd to the natural, with everything between and beyond. Smokers happen at 11pm every other Tuesday at the ADC Theatre. Each one is made up of roughly twenty 3-minute sketches, songs or stand-up routines. They could be about anything—quirky, edgy, trad, silly, sad—but they’re always “uproariously funny” (Varsity) and consistently “fast and hilariously unrelenting” (TCS). Smokers are experimental—where brand-new comedy material is all learned and all honed, all tried and all tested. They’ve sold out for four years running, so if you’re watching, you should book tickets very early. Yum, yum! 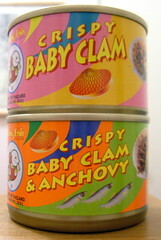 Bought these tins in Mill Road—I thought that they might freeze-dried clams. Would I eat them as a snack or rehydrate them? In fact they are Thai crispy-fried fishy nibbles that are delicious (but 30% fat). On my way home this evening I managed managed to snap up the last bottle of Tokay-Pinot Gris Roleibel VT, 1996, which finally arrived after the tasting we went to in November. Also got a couple of bottles of the Sylvaner Weingarten, 1999. Looking forward to having these! Popped into a cafe in Colliers Wood this morning because I arrived a little too early to visit Christopher & Matthew. I was a little hung over after going to the pub last night. Donna & Martin were there and a few of us celebrated Barry’s ‘official’ birthday until 12:45. Christopher made a fabulous lunch of roast guinea fowl followed by a lovely dessert that involved home-made caramel. I was impressed! I had my first Wii experience and did well at the 10 pin bowling, okay at the golf and was knocked out miserably at boxing. The Wii is clever and works well. I can see why some people have suffered RSI though, it’s quite physical. The graphics are superb (particularly if you have a new, massive, wide screen, flat panel, wall mounted plasma television). I particularly liked the mini-me characters that you set up for all the players: Christopher had already set me up with a mini-me, freckles and all. Now on the 17.52 back to Cambridge after a lovely day. Another late night production at the ADC Theatre, I can’t make the Friday night performance of the New Magic Show, so I risked going mid-week! Good show, staring three witches and Lady Macbeth from last weekend as the glamorous assistants. The show was funny and rude, and well geared towards the Cambridge audience. Simon Evans was funny and his magic was good, but I’d say less than 50% of the show. An uninterupted, unashamed, uncensored magic show. Card tricks, stage effects, card manipulations, the odd touch of fire, at least one horrifically dangerous illusion, and absolutely no iambic pentameter. At Cambridge, Simon Evans performed at many a May Ball, and on the ADC stage in 2005. He has performed in Las Vegas, New York and London and is a winner of the Close-Up Magician of the Year award. Since leaving Cambridge he has realised that magic is really all he can do… so he’s still doing it. For which his parents are very proud. 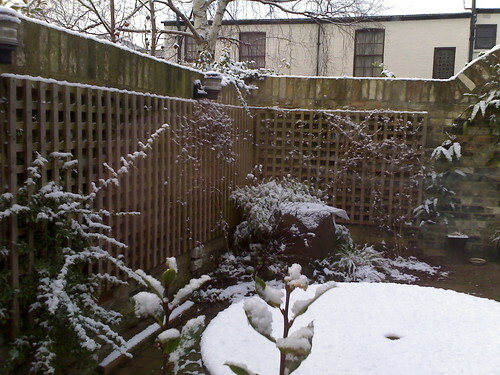 A little bit of snow this morning: and still snowing as I head off for work. It’s rare enough that it’s worth a comment! Saw Macbeth for the first time on stage last night, by the Cambridge-based European Theatre Group at the ADC Theatre. It was long (7.45–10.30) and the auditorium was packed. The stage was really well used, lightly full of smoke, highlighting the coloured lighting and dramatic use of powerful electric torches on stage gave a dark and brooding atmosphere. This production will draw you into a cinematically paced ghost-ride of eerie shapes and distorted sounds, a world made out of thunder and lightning, crowded by witches, apparitions, murderers and sleepwalkers, in which you can see dreams turn out to be horrifyingly empty and experience Shakespeare’s poetic language at its most powerful. Went to see a late night production at the ADC Theatre last night, The Resistible Rise of Arturo Ui by Bertolt Brecht, by the Pembroke Players. The play was only an hour long, but powerful. The cast held up posters to related the Cauliflower Trust to the Nazi party and the announce what historical event was being satired in the next scene. This worked well. The times are bad in Chicago. Arturo Ui, a small-time gangster with big-time ambition, is on the prowl. His prey? Vegetables. Cauliflowers, to be exact. The moral bastion of the city is bribed, the witnesses are silenced, one way or another, and the moral line blurred—this isn’t just about eating your greens. Brecht wrote The Resistible Rise in 1941 as a parable of Adolf Hitler’s rise to power; Ui (Hitler) is joined by a company of hardened gangsters, including a florist and ‘super-clown’. A down-and-out actor gives Ui lessons in public speaking. Chopin’s Funeral March plays in dance time. Slapstick is fused with hard-hitting political comment. The stage is heaped with corpses, and Chicago’s cauliflower is covered in blood. It’s been a stormy and windy day: the two winemakers from New Zealand were stranded at Liverpool Street and so we had an impromptu wine tasting of New Zealand wins, compared with European equivalents, held at Cambridge Wine Merchants on King’s Parade. Emma lent me this book when I arrived, without anything to read, at Durham. The writing style is excellent, light and humorous and suits the outlandish plot well. I laughed out loud at some of the bitchy descriptions of Valentina, and the Ukranian–English expression that she comes out with. Along with the other characters in the book, Valentina does grab your sympathies by the end of the book: she’s more complex than her “gold-digger” description on the book blurb. There was a lot of opportunity here for the book to have a negative, dark side: old age, abuse, Ukranian history, family feuds. However, the book is overwhelmingly positive.